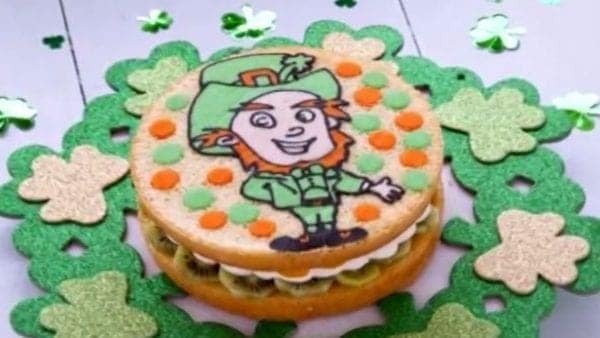 St Patrick’s Day Leprechaun Cake! 1 Make the pattern mixture. Print out the Leprechaun design on a piece of A4 paper. Mix all the ingredients together for the pattern. 2 Put a teaspoon of mixture in one bowl and colour it with a little white food colouring. Divide the remaining mixture between 4 bowls and add in few drops of green, orange, black and a tiny amount of pink food colouring into a different bowl. Stir well. Fill each piping bag with a different colour of the cake mixture. 3 Cover the Leprechaun pattern with a round 18cm disc of baking paper. To make it easier to trace, hold the paper in place by putting a few pieces of low tack tape around it. Cut a tiny corner off the end of the piping bags, then carefully trace around the outline of design in black. Then fill in with the remaining colours. Carefully peel back the tape. Slide the baking paper onto the tin base and place into the cake ring. Put it into the freezer for 15 minutes. 5 Sieve in the flour and very gently fold into the egg mixture. Remove the Leprechaun cake pattern from the freezer. Divide the cake mixture between greased and lined two cake tins.. Bake immediately @180oC for about 15 minutes. The cakes should feel firm to the touch when it so cooked. Remove from the oven and allow to cool completely in the tins on a wire rack. Once cold, unmould from the tins. Carefully peel away the baking paper. 6 On a large plate put the plain sponge cake. Lightly soak the sponge with the juices from the tinned mandarins. Put the kiwis over the sponge, then top with a layer of cream. Next arrange the mandarin oranges on top. Then place the leprechaun sponge on top.